"Obviously we are very, very glad that no one was injured," said Toronto police. 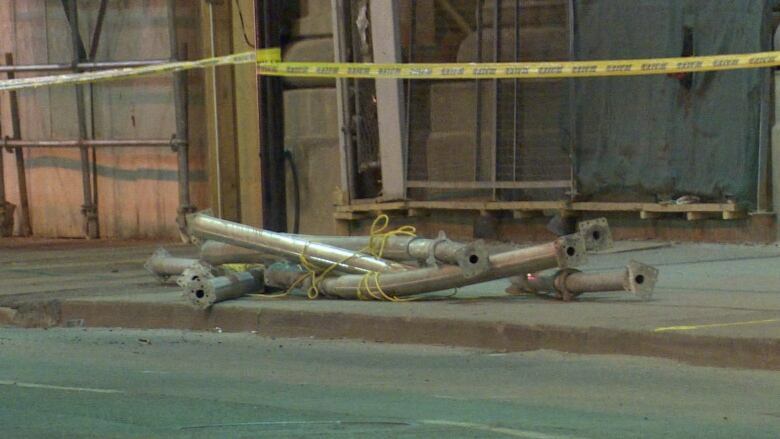 About 20 large pieces of metal construction equipment fell 60 storeys onto Yonge Street overnight, prompting police to shutdown the thoroughfare for several hours. The roadway was closed between Queen and Shuter streets around 4 a.m. Friday as a precautionary measure, said Toronto police Const. David Hopkinson. "We closed down Yonge for the cleanup of the metal and also to facilitate an investigation and make sure no other metal was going to be falling from the building," he said. "Obviously we are very, very glad that no one was injured." The pieces of metal, some of which were as long as 4.5 metres, were found on the roadway, adjacent to several construction sites. Police have since confirmed that the metal did in fact fall from a nearby work area run by MOD Developments. A spokesperson for the company said it's possible that the frigid temperatures overnight caused the materials to contract, and then high winds blew them off the building. A safety consultant and the company's structure management team are on site trying to determine why the equipment fell. Toronto police investigators are examining what may have caused the incident, Hopkinson said. Yonge Street was reopened to vehicle and pedestrian traffic shortly before 8 a.m.